My research is centred around identifying improvements to logging strategies to maximise biodiversity and ecosystem service retention in tropical forests. In recent years our awareness of the capacity of logged forests to conserve both biodiversity and ecosystem services, relative to other land uses has progressed significantly. While a huge amount of research has gone into understanding the impact of selective logging on biodiversity and forest dynamics, there remains a disparity in results and opinions. This is a result of studies overlooking crucial details, relying on small-scale studies and by extrapolating findings from only a handful of study sites. If we are to follow the promising route of using logged forests as a conservation measure, we have an exciting opportunity to maximise their conservation value through improved logging strategies. To do so, we need a comprehensive understanding of how each element of logging might impact biodiversity and ecosystem services. This is where my research comes in. I will assess the relative importance of multiple aspects of selective logging strategy using a dataset spanning 8,200Ha and including 130,000 mapped trees, using a combination of model-based and empirical analyses. By working closely with a sustainable logging company, AMATA, in Rondonia, Brazil, we have a real and tangible opportunity to improve the fate of tens of thousands of hectares of tropical forest and beyond. 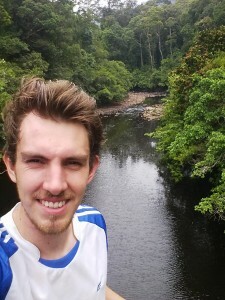 I’ve got a computational background with a love for tropical forests so I get great satisfaction from combining ecological data and computational methods to discover more about tropical forest dynamics. Beyond science, I’m big into my football and long distance running. Favourite player: Heurelho Gomes.